Horizon LIMS is a Laboratory Information Management System that aims to boost efficiency, configurability, and security of lab operations. The software platform helps organizations collect, sample, process, and deliver results using solutions that can be customized for multi-industry organizations – from public health, environmental, water quality, clinical, drugs of abuse and pain management labs. Developed under Red Arrow Labs and a member of the Dohmen group of companies, Horizon LIMS boasts of configurability, reporting and data integration to back operational efficiency requirements. The program works seamlessly with industry-specific reporting and third-party data integrations to match specialized client specifications. All needs are met while ensuring quality and regulatory standards and maintaining cost-efficiency. Horizon LIMS has custom solutions to meet different requirements for lab encounters of any kind and level of difficulty. 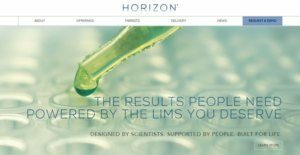 Horizon LabOnline upgrades lab operations with a self-service web portal for clients. The hub allows customers to easily and conveniently view samples, query data and generate reports in real-time. Horizon Logbook replaces tedious and outdated methods for data collection using trackable knowledge-sharing capabilities. Outdated paper logbooks and worksheets can be phased out to help boost efficiency and level up to paperless recording. Users can also sample custody, equipment and consumables tracking, complete with direct traceability from quality management system-related output. Horizon Field empowers sample collectors by allowing them to gather and store their data in remote locations. Even without a network connection, the program allows users to be more productive as they can work on materials anytime and anywhere. Horizon Instrument enhances instrument integration, which is a critical component in any laboratory automation plan. The module installs quickly and is designed for robust automation with minimal footprint. This allows users to quickly integrate new instruments into a system with minimum operational interruption. Horizon Report generates customizable reports fit for different lab requirements. The system offers comprehensive tools for building analytical, financial, operational and other reports, all intended to communicate important lab details and help organizations improve operations. If you are interested in Horizon LIMS it may also be beneficial to investigate other subcategories of Best Clinical Trial Management Software gathered in our base of B2B software reviews. It is essential to note that virtually no app in the Clinical Trial Management Software category is going to be a perfect solution able to fulfill all the requirements of different business types, sizes and industries. It may be a good idea to read a few Horizon LIMS reviews first as some software may perform well just in a really small group of applications or be prepared with a really specific type of industry in mind. Others might operate with a goal of being simple and intuitive and as a result lack complex functionalities needed by more experienced users. You can also find software that cater to a broad group of users and give you a powerful feature toolbox, but that frequently comes at a higher price of such a software. Be certain that you're aware of your needs so that you pick a software that provides all the features you search for. How Much Does Horizon LIMS Cost? Details on SMB and enterprise pricing for Horizon LIMS are not publicly available. Interested buyers may contact a sales representative to request for a customized quotation. We realize that when you make a decision to buy Clinical Trial Management Software it’s important not only to see how experts evaluate it in their reviews, but also to find out if the real people and companies that buy it are actually satisfied with the product. That’s why we’ve created our behavior-based Customer Satisfaction Algorithm™ that gathers customer reviews, comments and Horizon LIMS reviews across a wide range of social media sites. The data is then presented in an easy to digest form showing how many people had positive and negative experience with Horizon LIMS. With that information at hand you should be equipped to make an informed buying decision that you won’t regret. What are Horizon LIMS pricing details? What integrations are available for Horizon LIMS? Information on Horizon LIMS integration partners are not publicly available. If you need more information about Horizon LIMS or you simply have a question let us know what you need and we’ll forward your request directly to the vendor.